Mike Stoner is a full-time professional magician and mind-reader who entertains with a mixture of traditional magic, modern fast-moving psychological magic, palm-reading and metal bending. Mix one third Paul Zenon, one third Uri Geller and one third Derren Brown and you’ll be about right. Mike brings his unique brand of magic to parties, weddings, restaurants, trade shows and corporate events across Southern England several times every week and has recently performed for celebrities such as legendary Led Zeppelin guitarist Jimmy Page and Home Secretary Theresa May. 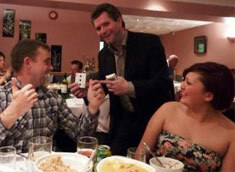 Mike specialises in close-up magic using cards, coins, watches and psychological techniques. There is no need for a stage or any large props, instead Mike mingles with your guests performing mini-miracles right in front of them or even in their own hands. The emphasis is on fun and creating a sense of wonder and amazement – something that will make your party or event memorable and extraordinary. Mrs N.P. - "Thank you very much for entertaining everyone at the wedding; I have had some lovely comments from people about how much they enjoyed the magic. I wouldn’t hesitate to recommend you to anyone else who wanted a magician at their party/wedding"
Award winning magician Clive Winterton ,a member of the prestigious Magic Circle, can entertain your friends and guests at parties, weddings and corporate events with close up magic laced with a cheeky humour that delights spectators of all ages. He is based in Berkshire however he regularly performs throughout the South of England. "I just wanted to say thanks for all your work yesterday at our wedding. The feedback we got from the guys was that you were brilliant! You were busy, but also discreet as we discussed, and it was perfect. We loved hearing all the cheers from the tables as you went round, especially off all my hammered mates!!! It's those sort of things that really make the day. We'll be recommending you to all our mates. When we get back from our hols we'll let you know the password for the photos online, if you want to use any for PR shots etc. Robert's demonstrations are a combination of sleight of hand, memory feats, psychological reading and hypnotic suggestion. His natural wit creates an exciting, fresh, lively and intellectually stimulating genre of entertainment. Robert entertains at corporate hospitality events, awards galas, trade shows and private parties. He can perform mingling with guests during a reception, between the dinner tables as well as a stand-up cabaret show. The performance is as entertaining as it is baffling and creates a fantastic experience for your guests. The style is full of comedy and interaction, as well as creating a memory your guests will remember for years to come. Contact Robert now to discuss how he can make your event a magical occasion. See www.robertbone.co.uk, email robert@robertbone.co.uk or call 0845 643 6065 or 07930 420 257. Award winning Magician John Vincent. Having been invited to perform at Buckingham Palace for Celebrities, Blue Chip companies and on Television, you can rest assured that when you book John you are booking a world-class performer who can tailor his performance for all of your requirements. Magic Moments Entertainment provide tailor made shows for children. To include Discos with smoke & lasers, bubbles and snow plus interactive games with prizes. Our magic shows are tailored to ages of children from 4 to 10 years old. We also have various themed parties like our Hogwarts Experience. Richard has been performing magic for children since 1991 and is fully insured and holds a current enhanced CRB. Brekk is known a renown children entertainer having entertained for such people as TV presenter Michael Parkinson and as a close up magician for both private and corporate. Member of the world famous Magic Circle and International brotherhood of magicians. A highly experienced magician, and mentalist Based in slough, Berkshire. Uncle Charley is a full time professional children's entertainer with over 25 years experience and has performed in thousands of shows across Berkshire, Hampshire, Middlesex, Buckinghamshire and Surrey. Uncle Charley will delight and please your children with his crazy mixture of magic, fun games, Punch and Judy, puppets, balloon modelling and mini disco with lights. Every show is designed to meet with your requirements, there is complete flexibility. Ideal for children's birthday parties, promotions, corporate functions, family nights, weddings and christenings and any other event where children need to be entertained. There are special shows designed for children with special needs and with learning difficulties. Every care is taken to ensure your event is a success and meets with your expectations.